CONSTANTLY USING OUR smartphones may have become the norm, but one of the lesser known perils of constant smart phone use is that they may actually make us blind. However, the kind of vision loss associated with “Transient Smartphone Blindness” is only temporary. The Irish News reports that a Fermanagh woman felt the experience while using her smartphone late at night. She said: “I was lying in bed on my side reading on my kindle app on my mobile phone at around 11.45pm. It was when I stopped reading and then turned out the light that I lost sight in my right eye – totally for one to two minutes and partially for up to 15 minutes. While it may only be an extremely rare occurrence, researchers writing this year in the New England Journal of Medicine believe that the ubiquity of smartphone use may lead to more cases of this temporary vision loss. It seems the problem chiefly arises when we view phones with just one eye as opposed to two. The researchers observed that with one eye closed and one eye on the phone screen, it led to the former eye becoming adapted to the dark and the latter becoming accustomed to the light. This tends to be more common at night time when lying in bed on our side. When the light in the room is changed, both eyes can have problems “matching up” leading to the person experiencing a blindness that can last several minutes. While it may not be a permanent problem, the researchers point out that more awareness of the issue “can avoid unnecessary anxiety and costly investigations”. Have you ever experienced this? Tell us in the comments below. Email “Using your smartphone at night could make you temporarily blind”. 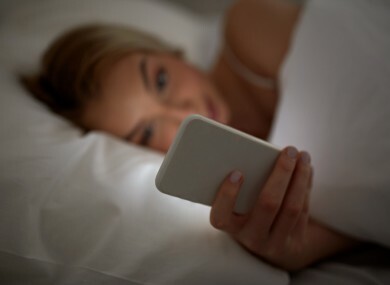 Feedback on “Using your smartphone at night could make you temporarily blind”.